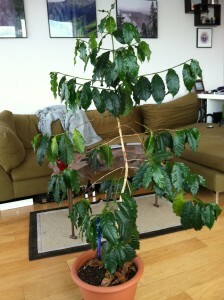 Just a short update on my experiment to grow coffee plants in a New York City apartment. Both plants are thriving! We’ve had some bug issues, but nothing catastrophic. One plant is a little crooked and not growing as tall, but growing VERY bushy. The other is growing nice and tall, but I need to work on the bushy-ness. Picture of the taller one below!